Archer on Airguns: Hammers Scopes are Outstanding Value! Hammers Scopes are Outstanding Value! If you are looking for a great value airgun-rated scope, then Hammers scopes really stack up well. Archer Airguns has just introduced the Hammers 3-9 x 32AO scope. This has a mil-dot reticle, adjustable objective focusing down to 5 yards, good image quality and comes complete with a strong one-piece mount. And all this for just $49.99. It's outstanding value! Below we see a photograph of the Hammers 3-9x32AO scope mounted onto a Ruger Air Hawk. It's the ideal scope to upgrade many popular air rifles such as this. Archer Airguns also stocks the Hammers 3-9x40AO scope. Very similar to the 3-9x32AO scope, this benefits from the larger 40mm diameter objective lens giving improved brightness in poor lighting conditions. This Hammers scope is just $59.99 including the mount! 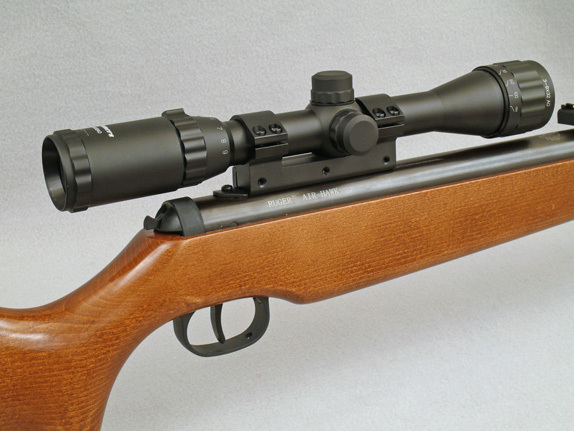 The photo below shows the Hammers 3-9x40AO scope mounted on a Gamo Whisper air rifle. 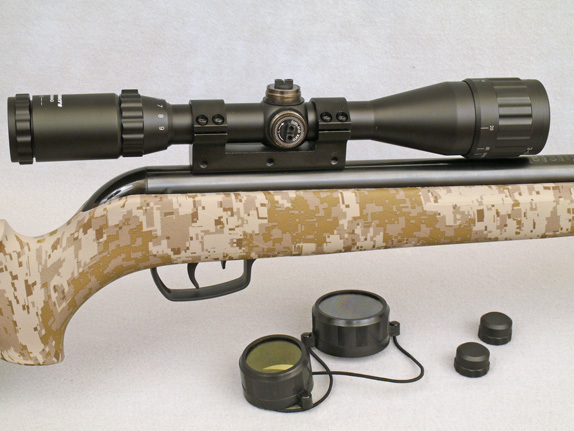 "A good scope that will stand up to the recoil of the springers I like to shoot is important to me. I don't want to be forever readjusting the scope zero from one shooting session to another, nor do I enjoy bold reticles which partially block the 1/4" bullseyes of the targets I shoot. The Hammers 3-9x40AO scope you sent me more than satisfies the demands I require. I was surprised in the best of ways with the overall quality and its smooth operation, as well as the bright, sharp optics. You've chosen to sell another 5 star winner at a great price. The addition of the one-piece mount is like the frosting. I'm very pleased with this purchase". Bullit, you have longer experience than us of these scopes, so your comments are very welcome! Certainly I've been impressed with the value Hammers scopes offer - at this price point there's little to touch them for quality, features or robustness. I just received the Hammers 3x9x40AO for my GAMO Big Cat 1250. When I mounted the scope on the rifle, I noticed that the mount base was flat, and the barrel was rounded. Even though the dove tail seated when tightened, the mount was not seated on top of the barrel. There was a gap between the two. Any ideas, did I get the wrong mount with the scope. Wanting to shoot, but nervous about the mount. Jayne, the mount does not have to seat on top of the receiver - and normally should not do so. There's probably nothing at all wrong with how you have the scope mounted. Enjoy shooting your new scope! Will this scope fit on my Gammo Hunter 440 .177? Silent Pellet Traps are Back in Stock Again.